Life exists after conception. Life did not exist before conception. At the moment of conception something happened. When the spark of life occurred, you have life when before you have nothing. After conception you have an existence emanating from a location within time and space. This existence has no dimension but it does have position. It exists in both time and space. The transition from nothing to existence took place in an instant. 1. On the left (input) side of the machine we put in a sphere that is one inch in diameter. 2. Inside the machine the sphere undergoes a change to become a sphere that is 10 inches in diameter. 3. The sphere is expelled out the right (output) side of our machine as a 10 inch diameter sphere. 4. This change took place in an instant. 1. 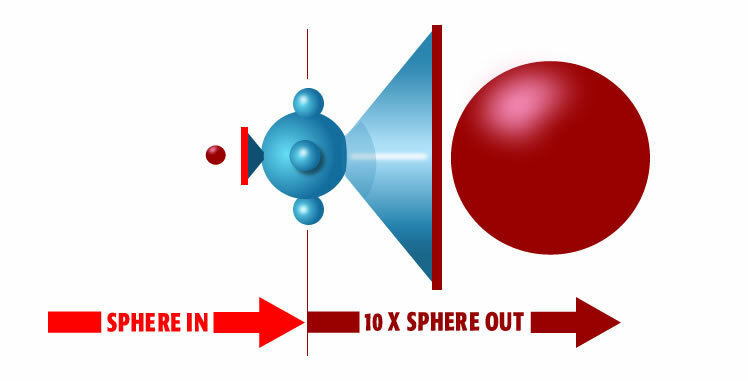 On the left (input) side of our machine we put in a zero diameter sphere shown as the small red dot. The sphere has position only. It has no length, width, or depth but it does exist. 2. Inside the machine the sphere undergoes a change where it becomes a sphere of unlimited diameter. 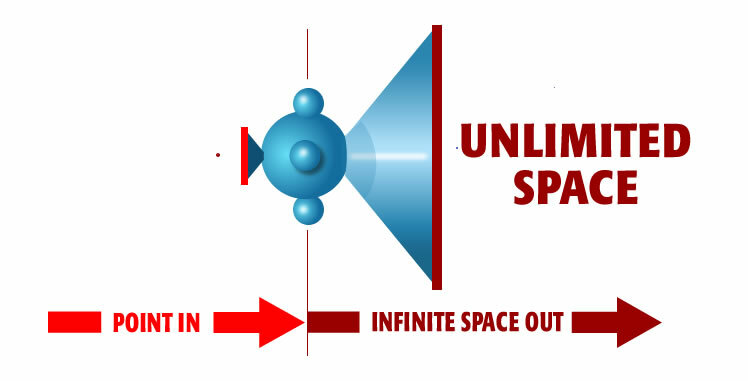 The sphere of unlimited diameter would encompass all of space. 3. The sphere, now all of space, is expelled out the right (output) side of our machine. To see how conception works we need to look at this change from a purely geometric perspective. Before conception (shown as the left side of the birth machine) the sphere is a geometric point. It is location only with no dimension. After birth the sphere becomes all space. It becomes a universe. The transition from point to all space takes place in an instant. You may think a transition like this cannot take place in nature but it does. This is a dimensional change of life. A dimensional change is when position within space becomes all space. It is when a geometric point is turned inside out to become the surrounding space. It is possible because our birth machine is now perfected. It takes the smallest possible thing and in one instant, turns it into the largest possible thing. By putting a geometric point through our machine, it changes dimension to become space. You may think our theoretical birth machine is arbitrary. You may think dimensional change like this never occurs in nature. Conception is the creation of life. How did life get there? Based on observation alone we can see that at the moment of conception life underwent dimensional change. The output of birth is life. Life is position within space. Keep in mind that before conception there was no life. 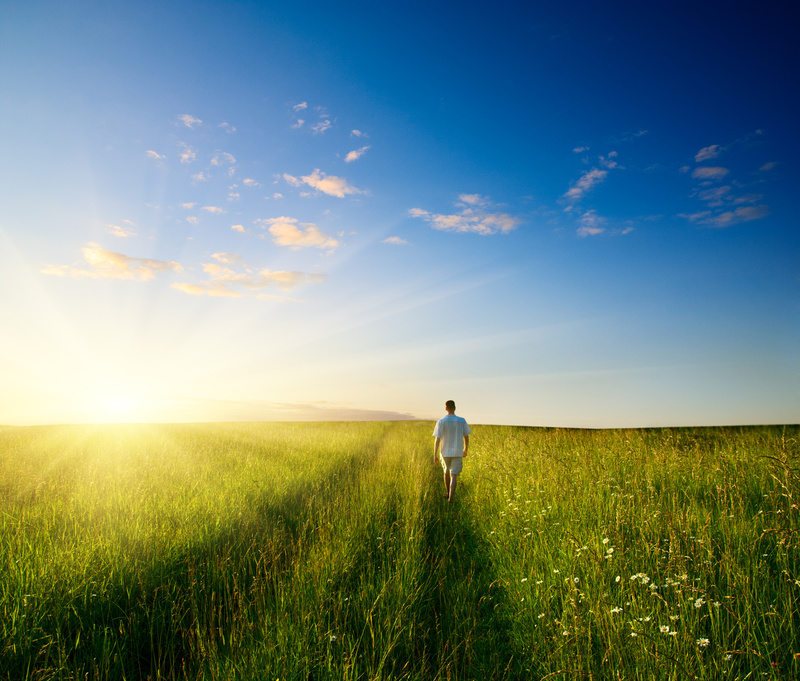 So what you have at conception is life going from nothing to position within space and time. Look at conception as the change from nothing to existence. Geometrically this is it is the same change as our birth machine. Mathematically the change from nothing to position and position to all space are the same. The dimensional change that takes position and makes it all space is the same dimensional change that takes nothing and makes it position. They are mathematically equal. 1. 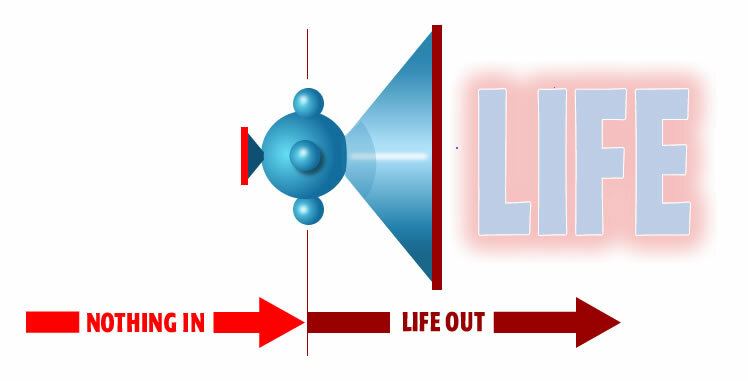 Before conception life is like zero-diameter points floating around just waiting to be born. They are so small they don’t even have position. Geometrically they are nothing. 2. All of a sudden one of these spheres gets sucked into the left (input) side of our birth machine. 3. Inside the machine life undergoes dimensional change and gets blown up on the order of magnitude of a geometric point becoming all space. 4. Life comes out the right side of the machine. 5. This dimensional change of life from nothing to position happened in an instant. This event is conception. Life coming into existence when a moment before there as nothing. 1. Conception takes place in an instant. This is a slice of time. 2. Life is the output of conception. Life is located at a point in time and a point in space. Life exists in the present. The present is a point in time. In like manner, life exists at a point in space. 3. Nothing was the input side of conception. Given these three observations what you have at conception is life undergoing a change from nothing to position in space and time. This change occurred at a point in time.